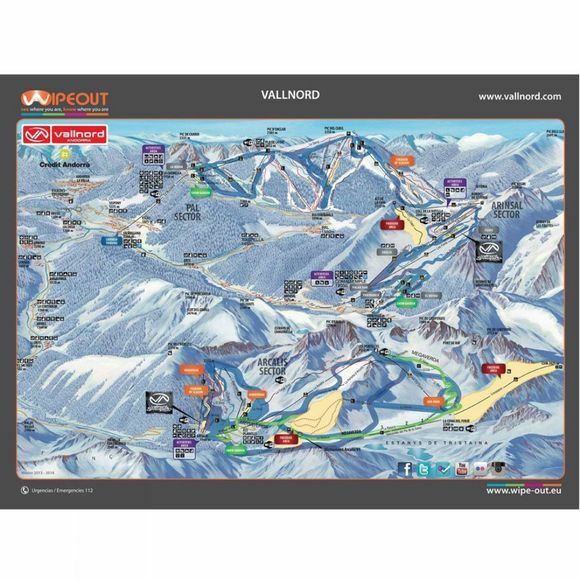 This handy Wipeout Lens Cloth covers the Vallnord Ski Area in Andorra; Arinsal, Pal and Ordino-Arcalis resorts, in a panorama style. Unlikely to be blown away in the wind, the Wipeout cloth can be used with your ski gloves and does not get soggy in the snow. Spend more time having fun and less time folding the map away, as the Wipeout Lens Cloth can be scrunched up in your pocket and disappearing in seconds. The map is the official and most current resort piste map, obtained directly from the ski area.